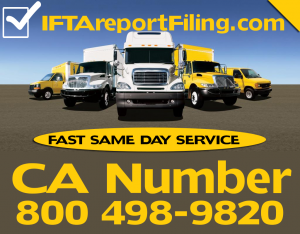 If you as the the Motor Carrier Permit require a CA number is determined by the following. IN-STATE CARRIERS: A commercial vehicle operated only within the state of California must obtain a Motor Carrier Permit and a CA number but does not usually need a U.S. Department of Transportation (DOT) Number. (1) Each vehicle set forth in Section 34500.
pounds gross vehicle weight rating. (B) A valid operating authority number. (C) A valid motor carrier of property number. listed pursuant to Section 830.6 of the Penal Code. carrier of property permit number. shall be deemed to be in compliance with subdivision (c). vehicle combination described in subdivision (k) of Section 34500.
pursuant to Section 25163 of the Health and Safety Code. with Section 36000) of Division 16. 26,001 pounds, when operated in noncommercial use. by the United States Secretary of the Department of Transportation. 5109 of the Public Utilities Code. (3) A for-hire motor carrier of passengers. other disposal of a vehicle marked pursuant to this section. If you plan on transporting freight interstate you will need a MC Authority also. The Motor Carrier Permit requires a CA number. IN-STATE CARRIERS: A commercial vehicle operated only within the state of California must obtain a Motor Carrier Permit and a CA number but does not usually need a U.S. Department of Transportation (DOT) Number. AS of 2105 all carriers in California require a DOT number. OUT-OF-STATE CARRIERS: Some out-of-state carriers must obtain a Motor Carrier Permit and a CA number in addition to the U.S. DOT number to come into California. For more information on who must obtain a Motor Carrier Permit, see the website: Motor Carrier Permit.